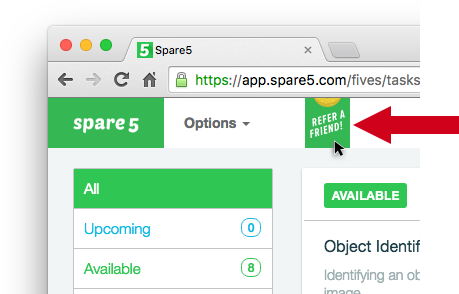 Spare5's Refer-a-Friend program makes it easy and rewarding to invite friends to join Spare5. Have you had a great experience being part of the Spare5 Community? Would you like to tell your friends about Spare5, and earn up to $20 doing it? Here's how it works: After you've been with Spare5 for a little while, you'll get the option to invite your friends. Each time your friend earns $10, you'll get a $2 bonus, and your friend will get an extra $1. This runs through your friend’s first 180 days or their first $100 in earnings (whichever comes first). To invite your friends: look for a personal invite link both in the iOS app and in Webtasks. Your friends must sign up using that link to be Spare5-linked like the BFFs you are. If the link isn't there, you might need a bit more experience on Spare5. You will be eligible to refer friends when you have received $10 in task payouts. On your iOS device: tap on the “Invite” link in the Profile tab. Grab your invite code and share that guy out via email, text, social media, or shouting it out on the bus*. *Spare5 is not responsible for your commute suddenly being cut a bit short.